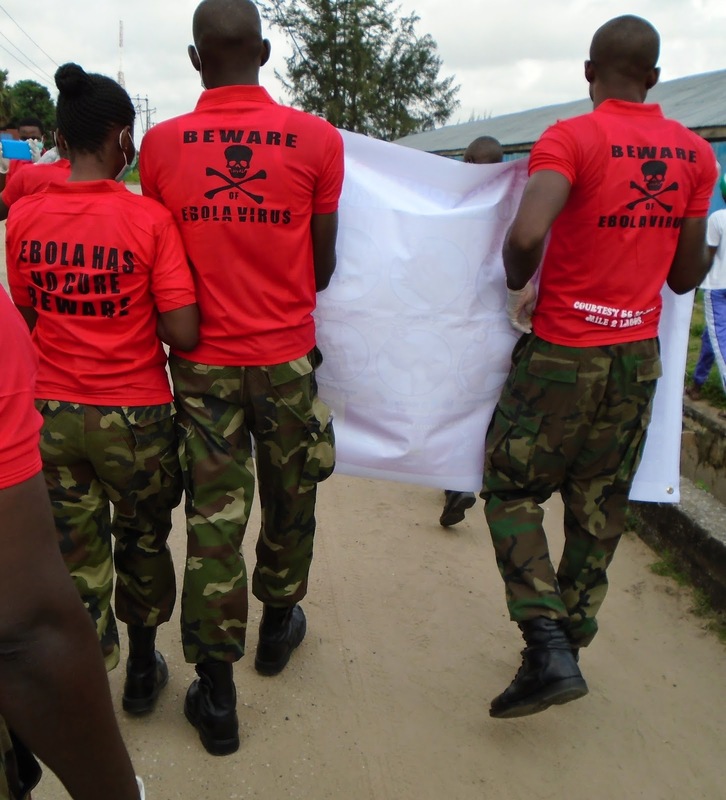 Clad in red t-shirts and their camouflage trousers, Nigerian Army personnel at the 56 Signal barracks, Mile 2, Lagos alongside members of mammy trader’s association took the streets to create awareness and campaign against the deadly ebola virus, reports NaijaAgroNet. The walk from the barracks, as monitored by NaijaAgroNet, took them to all the corners of the living quarters and outside the barracks. The more than two-hour walk culminated in a talk by Captain Nkem Aneke who also facilitated the event. 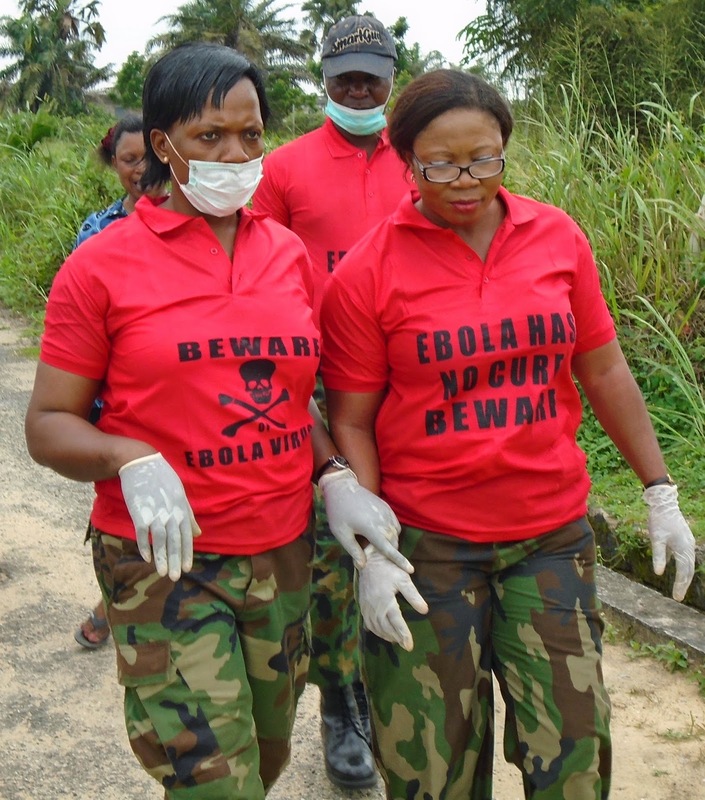 Addressing army personnel and traders on the symptoms associated with Ebola Virus Disease (EVD), Captain Aneke enjoined them to always report any suspicious case to medical personnel even as she urged families not to hide their relatives who are infected. 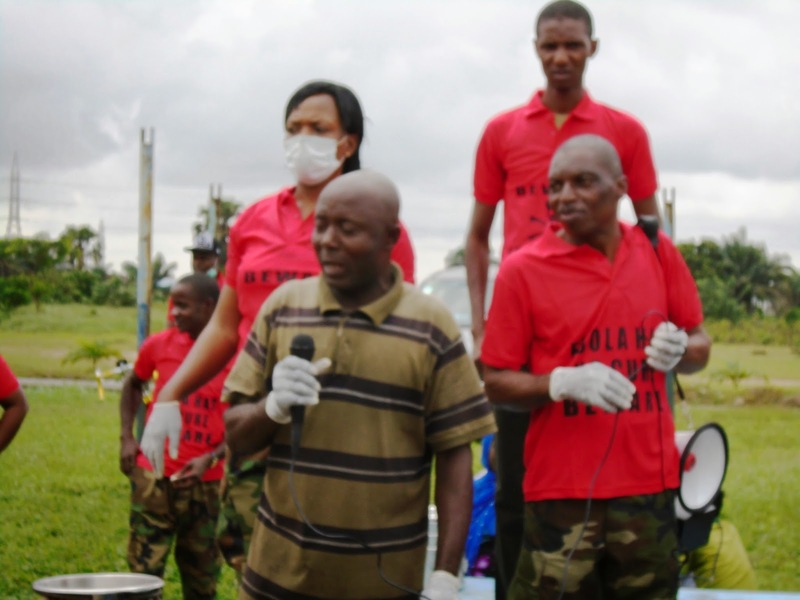 She emphasized the need for people to ensure they wash their hands always, the Nigerian Army officer debunked claims that using salt and warm water will go a long way to cure or prevent the deadly diseases if contacted. “Ebola Virus Disease cannot be contacted through air. It kills the body’s immune system. It can be contacted through shaking, sleeping with a person who is infected and coming in contact with any of the victim’s fluid be it sweat, blood or sweat and spit. It does not last up to one month in the body before the victim dies. So, when you notice anybody who has some symptoms that look like symptoms of Ebola disease who does not want to seek medical attention, inform medical personnel. Restrict the way you touch people. Handle money carefully. Avoid eating bush meat and restrict the way you socialise. Use sanitizers to clean your hands always thoroughly,” she advised. Some of the traders, who spoke to NaijaAgroNet, commended the campaign, saying it should be a continuous process to keep the topic fresh in the minds of residents and traders in and around the barracks. President General, Mammy Market Traders also known as Baba Magajia, 56 Signal Barracks, Mile 2, Mr Samuel Albert told NaijaAgroNet that the campaign is not only timely but coming at a time many people have little or no information on the disease. “I am highly impressed and I know this seminar will help everybody in many ways. If it is possible to be doing it periodically, it will be in our own interest. When you talk of about Federal Government (FG), you know they are trying. But it may not reach the grassroots and that is why this authority, organised this seminar,” he applauded. For the Magajia, Mrs Augustina Ohimite said the seminar was a welcome development, adding that the drama and the talk have deepened their understanding of the deadly disease. While commending the facilitator and organisers of the campaign, Assistant Magajia Mrs Comfort Alufa noted that what she learnt during the seminar will go a long way to understand how to prevent contacting the virus apart from sharing the information with other people. Highlights of the campaign include a road walk, drama presentation, demonstration on how to wash the hands thoroughly and distribution of drugs and glucose by the staff of the medical unit. 3. Special address during the exercise by a participant.